You’ll spend a third of your life in bed. A comfortable mattress that helps you get into a deeper, healthier and more refreshing state of sleep means this third of your life is spent as productively as possible. 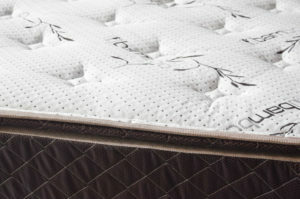 The mattress you purchase can have a significant effect on your sleep. Choose the right type of mattress for your needs and body and you’ll have rewarding nights that leave you feeling happy, healthy and energized. Choose the wrong mattress and you could develop sleep issues. Below, we’ve explained how your choice of mattress affects your sleep quality. We’ve also listed some of our favorite tips for choosing the right mattress for your needs, whether you purchase it from our Orange County discount mattress store or within your local area. If you’ve ever struggled to sleep due to an overly soft or hard mattress in a hotel, it’s important to know that you’re not alone. Most people experience some sleep issues due to mattresses, from overly hard mattresses that make comfort difficult to soft mattresses that provide little support. In fact, study data from Research Triangle International shows that the level of support you get from your mattress can have a significant long-term effect on everything from your sleep quality to your likelihood of developing back and joint pain. The study, which observed 128 people over a period of four years, shows that level of support a mattress provides can have a subtle but noticeable impact. Participants were asked to rate one of the several mattresses on perceived sleep quality. The data showed that participants tended to rate mattresses with a moderate level of softness (not very low or very high) as the most effective from a sleep quality perspective. Both very hard and very soft mattresses were associated with worse sleep, morning pain and a lower level of daytime function. The old adage that “medium-hard is best” might not be quite as true as was once believed. Interestingly, the study also showed that the mattresses participants rated as the highest quality while awake didn’t match their ratings while sleeping, showing that the body’s ability to assess a mattress without deep sleep isn’t always accurate. Choose your mattress based on sleep quality, not lounging comfort. Bed mattresses are designed for sleeping, and spending your time sitting in bed on a computer or watching TV can keep you up and make it difficult to fall asleep. Instead of testing your mattress from the perspective of overall comfort, test it with the mindset that you’re just about to fall asleep. This way, you’re more likely to assess its comfort based on how you’ll feel as you approach your normal bedtime. Ask for your doctor’s opinion. If you have back pain, an injury or another medical condition that could be aggravated by an overly hard or soft mattress, ask your doctor for advice before you select a mattress. People with back injuries often feel best on an orthopedic mattress, which provides support for your back and joints beyond what traditional mattress offers. Ask for your partner’s opinion. If you sleep with a partner, make them part of the purchasing process. After all, they’re going to share the bed with you and their sleep is just as important as yours. Consider latex, memory foam or a pillow top. These options can improve comfort and make it easier for you to fall and stay asleep, helping you get a better night’s sleep and an improved level of daytime alertness the next morning. Think of your mattress as an investment, instead of a cost. A good night’s sleep is worth a lot, especially when you need to be focused and productive at work. Think of your mattress as an investment in your health — after all, you’ll spend a third of your life on top of it. The post How Your Choice of Mattress Affects Your Sleep appeared first on Slumber N’ Serenity.